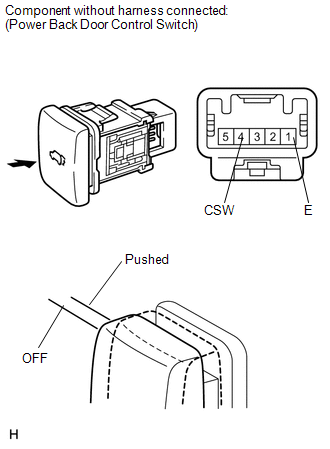 When the power back door cannot be opened or closed using the power back door control switch, one of the following may be malfunctioning: 1) power back door control switch circuit, 2) power back door ECU (power back door motor unit) or 3) main body ECU (driver side junction block assembly). confirming that the communication system is functioning properly. (e) Check the Data List to determine if the power back door control switch functions properly. The power back door control switch functions as specified in the normal condition column. (a) Check that the power back door operates normally (See page ). Power back door operates normally. (a) Remove the power back door control switch (See page ). 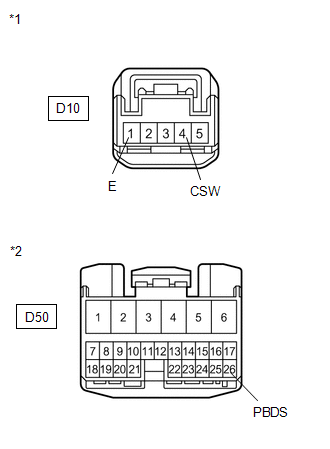 (a) Disconnect the D10 power back door control switch and D50 main body ECU connectors.